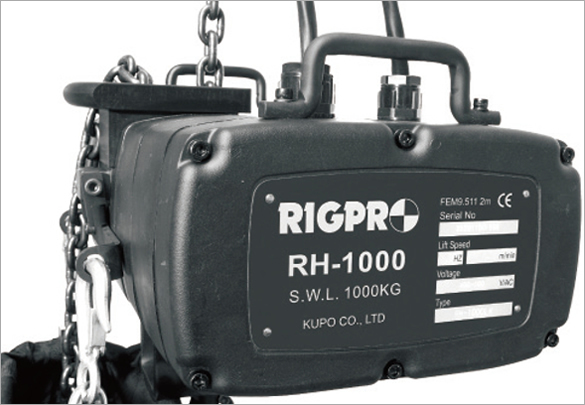 RH-1000P is designed for installation where chain lifting or hoist climbing to precise position is required. This new model offers the lifting operation an alternative manner in position control over simple and quick steps of maneuver. 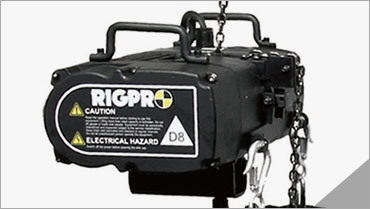 Each RH-1000P chain hoist comes with built-in micro switches and is equipped with up and down rubber blocks. Activate this system is just simple as 1-2-3: slide the rubber block to the desired position where you want to stop the moving, run the chain hoist with ordinary DC (direct control) controller, and then the lifting or climbing will stop while rubber block touch the micro switch on the nylon chain guide. No complicated setting; it’s no brainer. 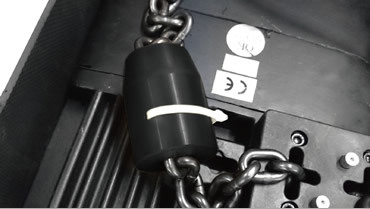 Whilst rubber block is fixed and running to touch the micro switch, the hoist will stop travelling immediately without delay, even the controller is set on working in this stage. 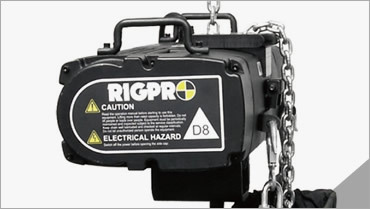 In the case of multiple chain hoists in operation, as soon as the micro switch is triggered on each unit, hoist won’t move an inch which ensures the fidelity to entire system’s stability and safety. 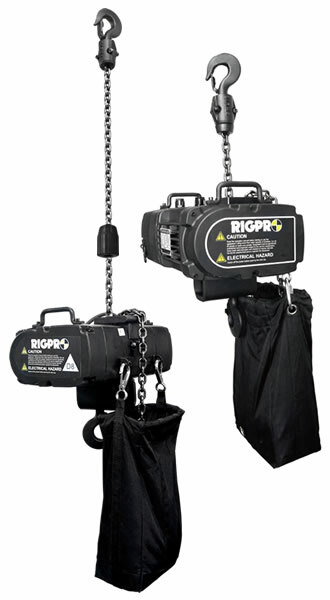 - Rigpro RH-1000 is a three phase chain hoist, loading rated for 1000 kgs, and built for rigorous entertainment rigging environment. - RH-1000 is available with DC (Direct Control) and LVC (Low Voltage Control) version, and operates in both upright and inverted positions. The forward-curve shape of enhanced Nylon keeps operating chain in the central position, away from getting stuck in the farther sides. RH-250 pulley type chain guide. Upper hooks apply material SF45C to cast which allow swiveled 360 and are equipped with safety latch to enhance the loading safety. Lower hooks apply material SF45C to cast which allow swiveled 360 and are equipped with safety latch to enhance the loading safety. Connection plate is bend and formed by high strength steel for excellent safety. While generated torque is over the friction torque, the overload mechanism will trigger, in which motor keeps running but slipping clutch hold back the hoist from further lifting for the sake of safety. 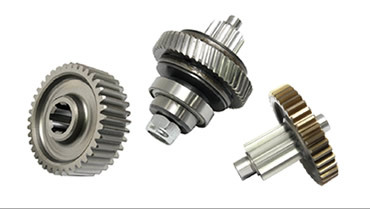 Gear is made of alloy steel with heat treat-ment for steady operation and less wearing and tearing. 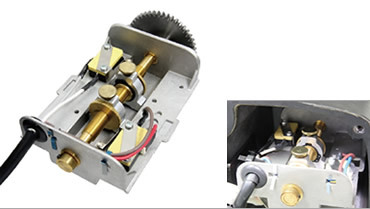 Fine-ground gear makes engage-ment precisely with less operation noisy. 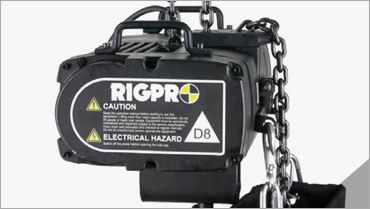 It can be handy adjusted to the required position, setting the chain travelling limits and offering the preventable method for hoist from over winding and damage. Electromagnetic disk brake will brake synchronously while the power is off, ensuring the operation safety while loading. 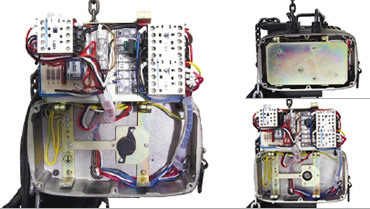 - High performance fuse circuit breakers are fastened in a rotatable bracket for easy maintenance and inspection. 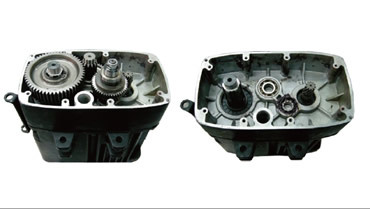 - The clutch torsion can be adjusted through a torque tool by a qualified technician. Easy to access and calibrate. 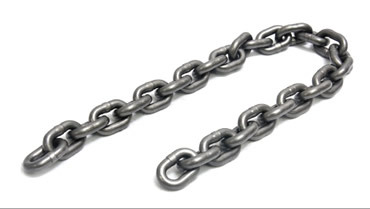 Premium quality and high strength alloy chain, heat treated, used in a variety of sling and tie down applications. 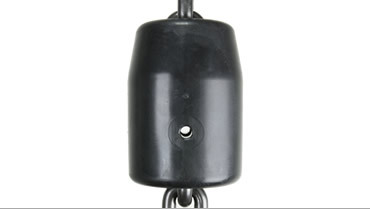 For overhead lifting applications, only Grade 80 alloy chain should be used. - Gravity die-casted aluminum, matt-black non reflective finish chassis for rigid, light-weighted, durable and low visibility. - Epoxy black powder coated chassis is featuring corrosionresistance, and with fine gasket and mechanical design, the complete unit turns to be IP54 rated. 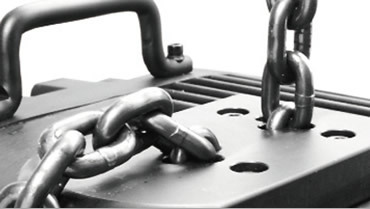 - Enhanced Nylon chain leading plate ensures the chain links properly fit into the lift wheel, and eliminates the possibility of jamming, as well as protects the lift wheel from wet and dirt. - Heavy-duty DC brake automatically gets engaged in the event of power failure, requiring very little maintenance and only minor periodic adjustments. 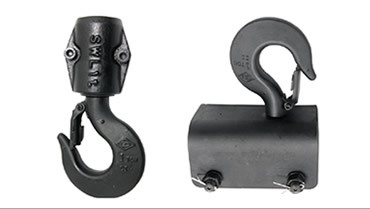 - Hook is made of drop-forged high tensile steel with heat treatment, allowing 360 degree swiveling, and equipped with safety latch to ensure proper rigging the load. - Equipped with duty cycle ED 40% high efficiency, lightweight and robust motor, running the chain hoist quietly and steady. - Operates on three phase voltage of 400V/50Hz, and LVC is 110V as standard. Other voltage for DC and LVC version is available upon request. - Conforms to FEM 2m / ISO M5 classification, covering a wide range of applications. 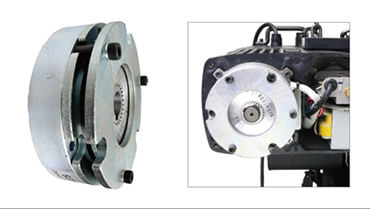 - DC Motor Brake: With two-side single disk brake, electro-magnetic brake actuates synchronously in the event of power failure to ensure the operation safety while loading. - Overload Slipping Clutch: Protects the hoist from damage of overload, and ensures the life-span of chain hoist. and not allow lifting the load. Instead, it permits coming down to release the load. 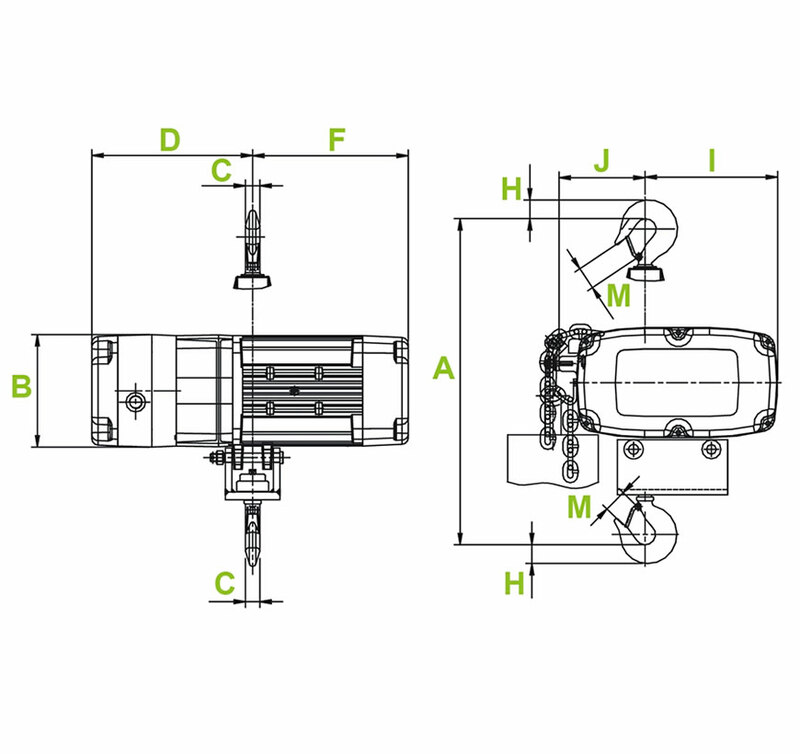 - Gear Limit Switch (only applied for LVC version): Upper and lower limit switches are fitted to switch off the power simultaneously in the case of over lifting or lowering position. - Phase Protection (only applied for LVC version): Built with phase error relay, in case of any phase missing or incorrect, the machine will not be in active, ensuring the safety and durability to all components. 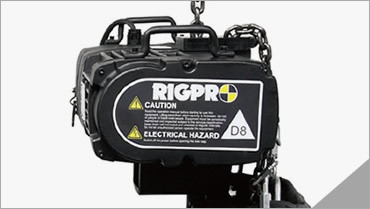 New feature on Rigpro chain hoist—rubber block with micro switch positioning—sets the limit of hoist movement easiest ever. 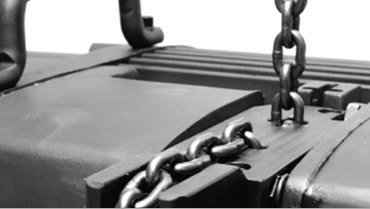 Grab and slide the rubber block to set the travel limit; no bother opening up the chassis, and it’s totally tool-free! A brand-new way to run the DC hoist that you shouldn’t miss out. See how it works or visit www.stage.com.tw for more details.